I’m a complete anomaly in this industry. 60 years old in October!!! 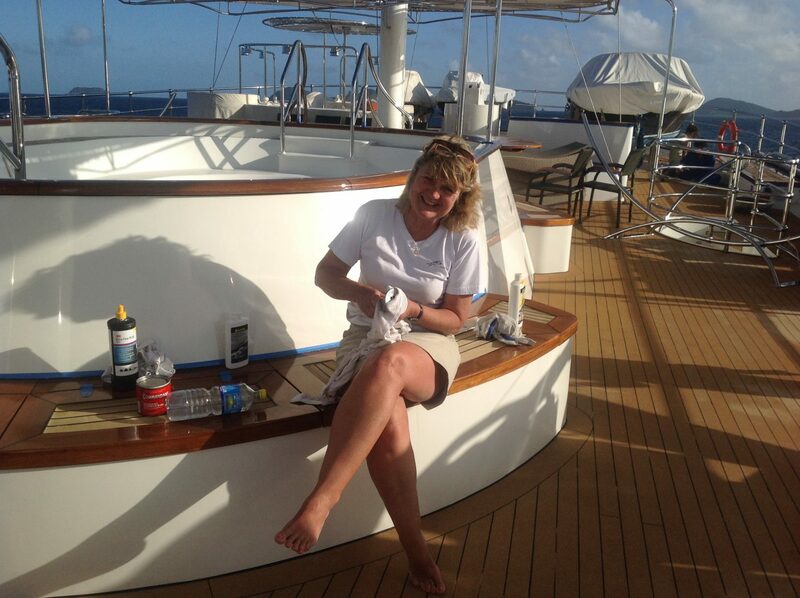 I started in megayachts at 54, right at the grass roots (in housekeeping) working my way through charters and refits. My background is in cruising yachts with children born in the Commores and Grenada. I ran the office administration of Quantum Sails in St Maarten for 17 years and was the manager of the St Maarten Yacht Club for 5 years. It was at the SMYC that I met my captain, Bernard Vivegnis, and where we decided we’d make a magic team, both personally and professionally. How right we were! Our previous ships, the Sherakhan and the Legend both cater for 26 passenger. The SS DELPHINE, an original steamship from 1921, is our present boat. At nearly 100 years old, this ship is the one I identify with most 😉 It is on this boat that I’ve become “mummy on a megayacht”. My position is a complex one – A mix of Chief Stewardess and Purser. I provision, arrange tours, check for fingerprints and calculate crew wages. I’m the sounding board for frustrations and inspirations. I hire the junior crew, coach them, discipline them and praise them. Delight in their progress and protect them like a she wolf! The greatest advantage of our team is our experience and stability.